The world's tropical rainforests are invaluable. They are hotbeds of biodiversity, they clean the air and produce the oxygen we breathe, and they store a vast amount of carbon dioxide that better stays where it is. But global economic pressures have forced small and large farmers in Brazil, Congo, Indonesia or Papua New Guinea to cut and burn down their forests, in order to extract tropical hardwood or to plant cash crops such as coffee, rubber or palm oil. Through this mass-deforestation, enormous amounts of CO2 are pumped into the atmosphere, contributing up to 25% of the world's total amount of greenhouse gas (GHG) emissions. South America's Amazon forest alone holds some 60 gigatons of carbon — more carbon than all countries release from cars, power plants, and other human-related activities in a decade. If deforestation continues at current rates, the efforts to reduce GHG emissions elsewhere might simply be negated. Now a new paradigm is emerging that tries to prevent this, by coupling voluntary reductions in deforestation to financial incentives in the form of "Compensated Reduction" (CR) credits. The idea is to use a market mechanism similar to that of carbon trading, that would award tradable "credits" to countries that voluntarily reduce their deforestation rates below historical baseline levels. Those countries could then sell the credits to other nations that are unable to meet their emissions reduction goals. By providing a monetary incentive for nations to preserve their forests, the strategy would encourage greater developing-country participation in the Kyoto agreement aimed at reducing GHG emissions (which currently only applies to industrial countries or in a small and indirect way to the developing world via the Clean Development Mechanism). To ensure the validity of countries' claims, compensation would be given only after a specific period of time and after sufficient satellite and on-the-ground observation. The countries would also be committed to further decreasing or at least stabilizing their deforestation rates in the future. Environmental Defense and the Amazon Institute for Environmental Research are amongst the environmental groups lobbying to get this CR system included in the second phase of the Kyoto Protocol. 1. First of all, there is a problem with the decision-making process and with the level at which the scheme is controlled. It is a top-down approach involving governments, bureaucracies and international bodies. The plan looks at forests as integrated wholes and the CR would only apply to declines in deforestation as they are observed at a national level. Thus the system is designed by and for technocrats, who keep control over the revenues generated. Now we all know that governments in the developing world have a bad reputation when it comes to transparency and accountability, and the CR-system will tend to exacerbate this situation, because it is a top-down scheme. The money from CR-credits will never reach the people on the ground, that is, those small farmers whose only way to make money is by cutting down forest to plant cash crops. A more important question must be asked: why strive towards environmental accountability, when social justice and accountability are cut out of the loop? Because after all, it is the lack of social and economic justice, experienced by small farmers, which is responsible for the deforestation in the first place. Small farmers don't burn down forests because they like to, they do it out of sheer necessity, because they are poor and want to survive. So unless this CR-scheme is coupled to an extremely strong "social justice" monitoring mechanism, it will go nowhere. In fact, there even exists a chance that the CR-system -- which is a source of revenue for national bureaucrats -- puts governments against their own people. When the money does not reach the communities who do the actual logging and burning, they will simply continue to deforest. And when the bureaucrat can get more money out of the CR-mechanism which is aimed at halting deforestation, he will target the small farmers who do not obey his rule. (Added to this, and in a worst case-scenario, these poor farmers might even be forced by the state to resettle, to move away from the forests, in order to control their activities more easily. (In the past, many governments in the South have already forced millions of people to resettle, but back then it was to achieve the opposite goal, namely that of colonizing rainforest, to exploit it, and to relieve population pressure on urban zones). 2. Secondly, there is a problem with timing and synchronisation. The CR-scheme will only hand out money "post-facto": a government first has to demonstrate that deforestation rates have declined, and only afterwards does it get the money in the form of credits. This means that such a government must first compensate foresters and farmers for years, using money from its own pocket. Money it doesn't have. A government might use alternatives that do not require putting up money in advance. One well tested alternative, with which many developing world governments have a lot of experience, is that of structural and social violence against their own people. In this case, against poor loggers and forest smallholders. For several years, they will be forced not to touch any forest, from which they make their living. And they will not be compensated for their losses for years. In short, unless the CR-mechanism hands out credits "ante-facto", the scheme is unlikely to succeed, or it creates a risk of inducing social violence. 3. Thirdly, besides the problem of control and timing, the question is whether the free market can ever achieve 'the right price' for the carbon sequestered by the forest. This is a matter of opportunity costs. With the arrival of tropical biofuels that offer a competitive alternative to sky-high petroleum prices, tropical forest land has become extremely valuable. People in the tropics are beginning to understand this. It remains to be seen whether the price received for the carbon stored in one hectare of rainforest (the CR-credit), will be higher than the price received for liquid biofuels derived from palm oil or sugar cane, for which one such hectare of forest had to be burned down. More fundamentally, opportunity costs should include a 'historic deforestation debt' and the added values created by deforestation that exceed the mere cash received from palm oil or rubber or sugarcane. Earlier, we hinted at this need for a broad definition of historic opportunity costs when we looked at the economic benefits the US and the EU got from cutting down their forests long ago. When they did, it brought them modernity, wealth, and progress. Deforestation brought mobility (roads, rail, urban sprawl), it allowed for the development of an agricultural sector that could feed a rapidly growing population; it allowed the transition from agricultural to industrial societies. In short, it allowed for real modern societies to exist. There is no modern society that has not deforested vast swathes of its natural forest. This historic and long-term added value must be taken into account. Just allowing the market to put a short-term, ad-hoc price on non-deforestation (by equating it merely to the amount of carbon that remains sequestered), actually negates these added values. Malaysia offers a concrete example of what we're trying to say: there, deforestation for the vast palm oil and rubber industry has been detrimental to the environment, but it has allowed the country to grow economically, and to lift millions of poor people out of poverty. It has given an economic boost with indirect effects in many other economic sectors, that far exceed the value of a the mere plots of forest that were cut down. Will the CR-credit express these indirect benefits and express them as incurred losses for which a premium must be offered? Now one could argue that the costs of global warming will be far greater in the future, than the economic benefits derived from the current practise of deforestation and logging (as they can be observed from looking at America or Europe's past or from looking at recent economic profits generated in Malaysia or Brazil). But the problem is that the past is more certain than some abstract future represented in some abstract system by some abstract government. And when a smallholder in the tropics looks at the past, he equates deforestation with wealth. To him, it's one of the few certainties he has. He will not easily be tempted to stop deforesting for some abstract future cause, unless he gets a serious premium (on top of the CR-credit). Certainty is a factor in opportunity costs. Moreover, the State is seen as a factor of uncertainty, and since the CR-system is managed by the State, the individual farmer will want to get a premium for this uncertainty too. 4. Fourth, with sky-high oil prices, tropical biofuels are now competitive to crude oil. There is no end in sight for rising oil prices, and if Peak Oil were to be imminent, there will be a rush on tropical forest land for biofuels. It is very unlikely that the price of carbon that the CR-system might put on a hectare of forest, will ever compete with the actual value of a biofuel plantation on this same hectare of forest. In this context, biofuels must not be looked at for their environmental benefits (reducing GHGs), they must be looked at as being a commodity that can compete with crude oil, and for which prices are rising to record levels. The same story holds for the millions of hectares of natural rubber tha can be found on rainforest soils. When oil resources are in decline, only natural rubber can substitute for synthetic rubber. Which means tropical forest land for rubber becomes more valuable. (Prices for natural rubber have already increased 300% over the past 4 years). In short, we see many problems with the "Compensated Reduction" proposal. It doesn't guarantee social justice, on the contrary, it even threatens it. CR has a problem with timing, because it forces poor governments to invest money upfront to compensate smallholders and loggers, before they get any in return (money they don't have). Given ever increasing oil prices, CR-credits will not be able to compete with the value of tropical biofuel plantations the value of which keeps rising, following the trend of rising oil prices. Worldchanging: Environmental Groups Propose Tradable Permit System - August 28, 2006. Environmental Defense, introduction leaflet to the CR-system: Compensated Reduction: A Novel Approach for Tackling the Largest Source of Greenhouse Gas Emissions in the Developing World [*pdf]. Amazon Institute of Environmental Research, 2004, Compensated Reduction of Deforestation [*.pdf],- shows experience with a similar scheme in Brazil. Environmental Defense: Compensated Reduction and Climate Change. 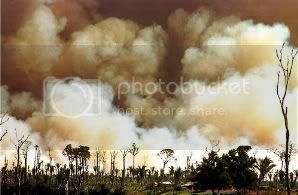 Cutting greenhouse gas emissions by slowing tropical deforestation - 5/3/2006, and see sources there. G. Cornelis van Kooten, Alison J. Eagle, James Manley, Tara Smolak, How costly are carbon offsets? A meta-analysis of carbon forest sinks, Environmental Science & Policy 7 (2004) 239–251 [*.pdf]- mainly looks at reforestation, but also sheds a light on how to calculate the costs of non-deforestation (conservation). BBC, Request for forest carbon credits - 17 May 2005, Papua New Guinea's proposal to be compensated for not destroying any more rainforest. Seattle Times: "Developing Countries to Seek Pay for Preservation of Forests" November 28, 2005. A preview of the upcoming proposal by a group of 10 rain-forest nations to address climate change through forest and land conservation. BBC, Concerns over EU carbon trading, 15 May 2006 - consumers pay the price, the polluters make money by polluting more, and all this under a scheme exactly aimed at achieving the opposite.